Caption slip reads: "Photographer: Miller. Date: 1958-01-21. Reporter: Sid Bernstein. Assignment: Couple attacked by dogs at 640 Lorna Lane, West Los Angeles. Inside of Maurice Olivier home showing incredible disorder, center, where couple slept on floor and were attacked by their German police dogs. Cluttered table in a room, on table are microscope, loaded pistol, doctor's tools and some of the thousands of radio and electronic parts scattered about house. 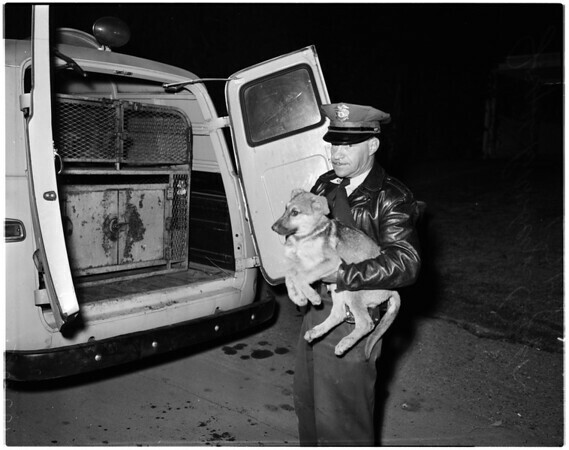 Inspector Joseph Bamberger (uniformed) and Supervisor Robert Krause with dog "Gunner" showing burn on dog's back. Krause with some of captured pups".